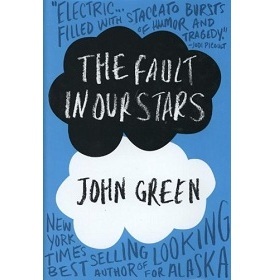 The Fault in Our Stars is a book in the Romance genre written by John Green. The book was published by Dutton Books on 2012-01-10 and contains 318 pages. The book has an ISBN number of 978-0525478812. Our users found the overall impression of this book to be Inspirational. Hazel is a 16 year old girl with stage IV thyroid cancer, and has been living with an oxygen tank since she was first diagnosed at age 12. She realizes she is going to die, but she is on a drug that is keeping the tumors at bay. At a support group meeting she meets hottie Augustus Waters, who is in remission. They immediately hit it off and change each others lives. Is the story exciting and believable? yes. Are the characters realistic? Their story isn’t simple, isn’t nice and isn’t all sunshine and flowers, but it’s beautiful. If you read part of the book, does it make you want to read more? Their friendship kept growing, and I was so happy for them, yet so sad, because it couldn't last. Gus didn't stand a chance. I would have done anything to be able to find him a cure. Anything. Would I recommend this book? YES! It tackles cancer, death, loss of loved ones, love, shows from a girls perspective what it may feel like to know you are dying. It is worth every tear.